The recent massacre that happened in Virginia Polytechnic Institute and State University has sparked another debate regarding gun control in United States. Bully A (James): Hi Joe ..
Bully B (Joe): Hi James. What’s up with you? Bully A (James): I’m depressed Joe ..
Bully B (Joe): Why? I thought bullying is fun. Did you bully too many or too few kids? Or is it you stressed because your bullying method is become a routine, no longer excites you? Do you need new bully targets with different demographical background compared to the current ones? Imaginary Friend:What’s up with you? Imaginary Friend: I have a better idea. 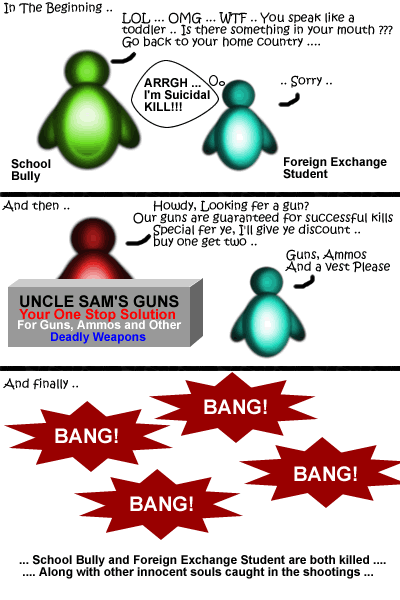 Why don’t you buy guns and kill the one bullied you. This way, you can make a payback to him. You also might want to consider shooting random people to build the tension. In the end you could shoot yourself. This way, you will get what you’ve just said. 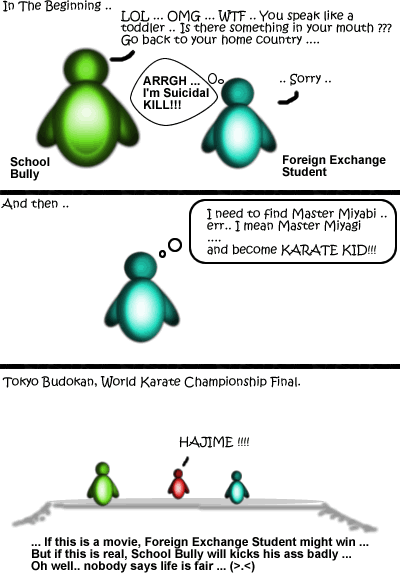 CONCLUSION: Gun Control must be implemented, this way we will only have Bully and Karate Kid. No more mass murderer, School massacrer, random sniper, etc, etc. That’s what I think, so what do you think? not all bullied want to be a mass-murderer. I believe my point was the depressed people are dangerous to themselves and people around them. It’s more on the depressed, rather than bullied. Depression can make people do the unthinkable, remember that mother in Malang, East Java that lethally poisoned her 4 children, before ending her life? I’m not for gun control. What I am for is helping people out who are depressed and giving them the medical assistance they need to lead a balanced life. Not every depressed person ends up killing people and not every murderer battles depression. But if we take out the gun from the equation, would the number of casualties/innocent souls will be reduced? If a depressed/suicidal guy run amok with a M16 in a public crowded space, how many people would die before someone put a bullet in the perpetrators head? Now consider if the same guy run amok with a dagger/sword/ chainsaw ? The probability of people outrun the perpetrator is much higher. I mean, can you outrun bullets? If everyone had guns, it is likely that the man with an m16 would fire less than a quarter-clip before he himself is gunned down by multiple citizens protecting themselves. with that in mind, it is even more likely that he would never consider a shooting rampage. They can’t keep drugs off the streets. They can’t keep illegal immigrants from crossing our borders. If tons of drugs and entire populations are able to walk into the country without a problem, what makes you think they could possibly round up all the guns? And say they even got up the political will to seal the borders, inspect shipping containers and search vehicles at the borders. Do you have ANY idea how much that would cost? I’d like to keep my taxes below 50% if at all possible. But if you take the guns away from those wishing to use the rights given to them, then only the criminals will have them. This results in even more deaths. Only because there is no way for the innocent to defend themselves and there is a decreased risk of someone with a weapon to be harmed themselves. Basically what you are perpetuating is the possibility of an even HIGHER body count until the authorities that have weapons show up to stop the gunman. Good thinking. That will solve all the problems now won’t it? How about this… Say you are someone that is planning on shooting somebody else. You pull a gun on them and they pull a gun on you, are you going to be more or less willing to pull the trigger? I’ll tell you one thing, ninety percent of people in that situation would freeze. How do I know? I was in the military, it happens all the time until you actually shoot someone. Shooting an unarmed person is like shooting an animal. You don’t think twice because you have the power. Trying to shoot someone that is armed themselves is a lot harder. You have basically a 50/50 chance of survival. To control the gun, basically Countries in this world need to make an agreement/treaty to outlaws gun. Keep the guns for the military personnel/SWAT. If you can’t control the distribution, control the production. For the public, give them TASER gun. how is cocaine manufactered, probably not under government supervision. so how can they stop it if they allow them to keep making them for the military then what stops the blackmarket from getting a hold of them? I wonder whether we can apply the same logic of Gun Ownership with something more lethal, say nuclear weapons. they should take some serious steps to avoid incidents like Virginia tech.